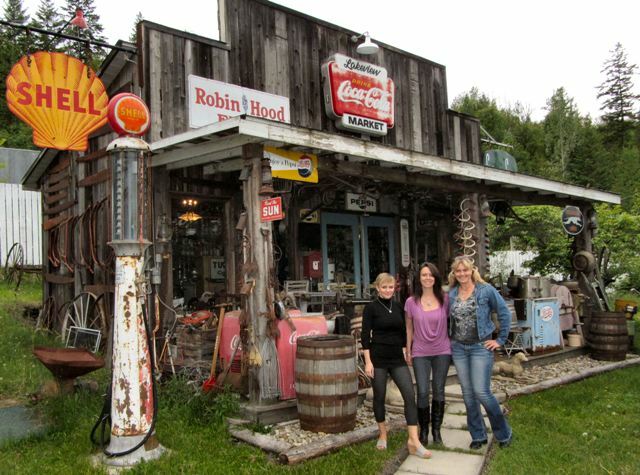 Jim moved to the Shuswap area from Newfoundland and became passionate about preserving the history of the area through collecting memorabilia and antiques. 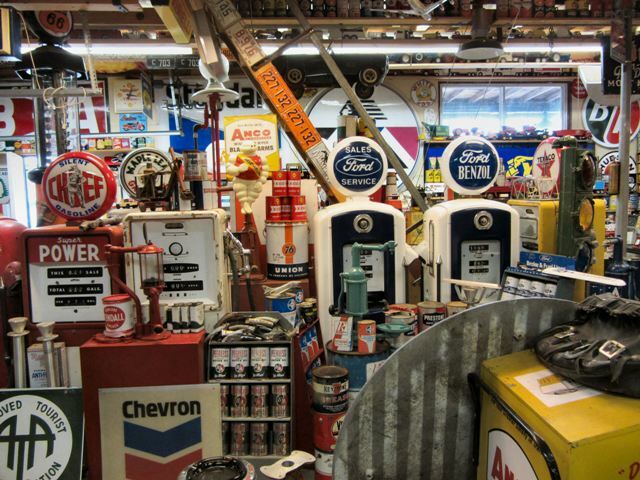 In the past 11 years he has transformed his backyard into trip down memory lane with his large collection of gas station memorabilia, old cars, toys, bikes, you name it. 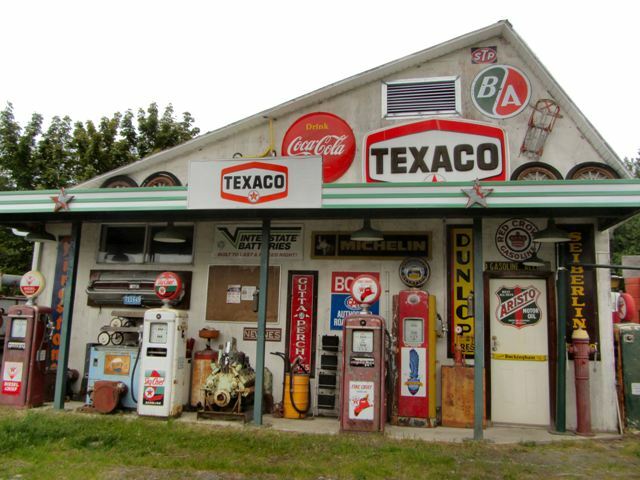 He constructed a number of old-fashioned buildings out of old wood to house his collection and to give visitors the feeling they are stepping back in time into an old country store. Back in the days when small communities like Sorrento only had one store, it was the place where people would buy everything from a tub of lard and a jug of wine to a lantern and meat grinder. 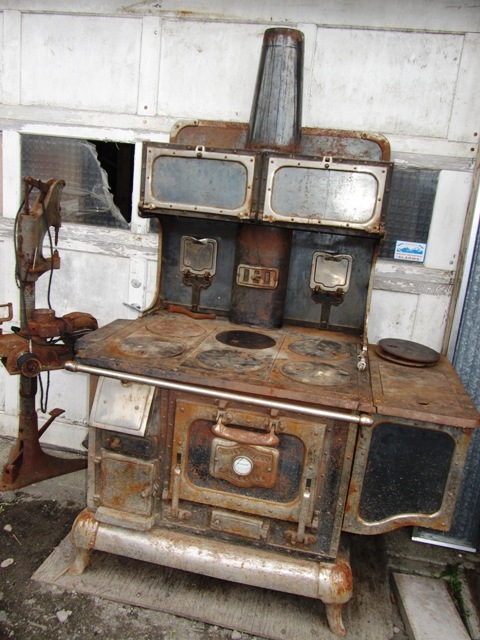 When I visited his place with two of my friends, we felt like we were on an episode of Canadian Pickers. Jim brought us through his collection pointing out items of interest and teaching us some history of the area through the objects. 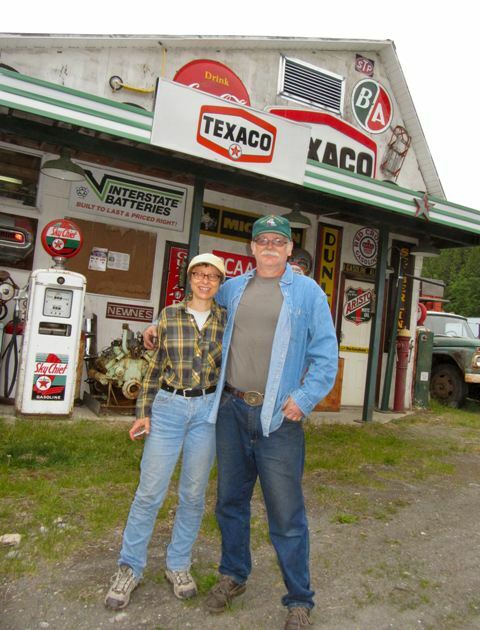 He has a gas pump from Home, a gas company that operated exclusively in British Columbia in the late 30’s until they were bought out in the 1980’s by Esso. 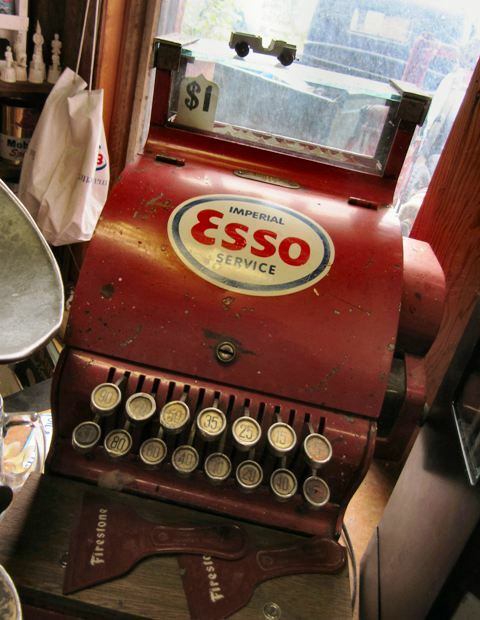 He also has a large collection of Esso and Imperial signs, pumps and other memorabilia. 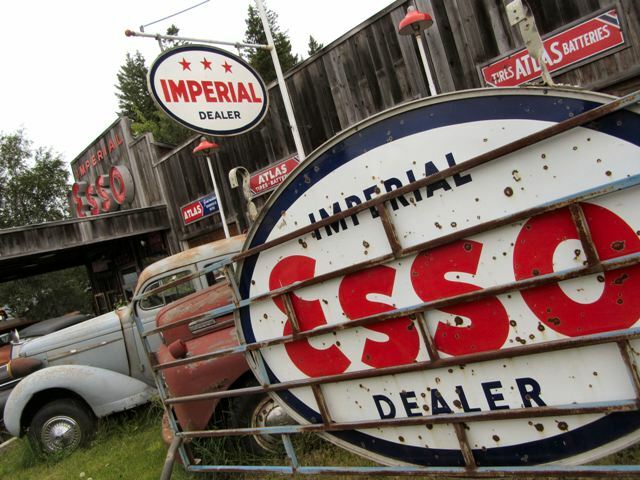 While pointing out the items he explained that Imperial Oil was only in Canada and Esso was a brand of gas they sold then eventually they changed their name to Esso. He also has a few complete sets of Jello wheels from the late 1960’s. These disks had pictures on them and were the size of a loonie. One disk came in each package of Jello and there were 200 disks in a set. Kids traded them in an effort to obtain a complete set much like they do with pogs today. Another item of interest was a ball point pen vending machine. The first ball point pen went on sale at Gimbels Department store in New York on October 29th1945 for $9.75 USD. 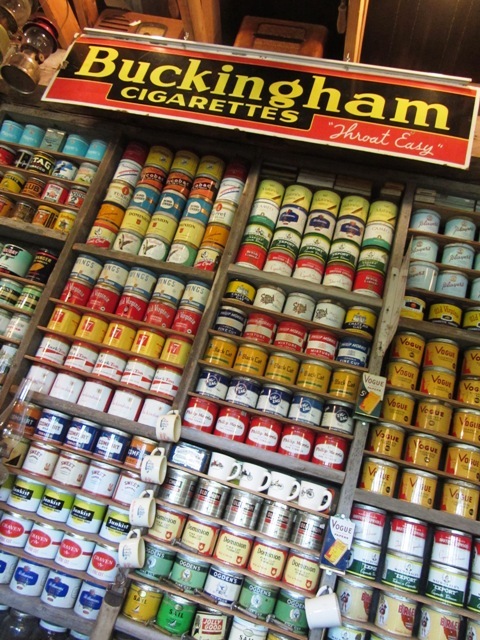 As they became popular, the price went down and they were sold for as little as 5 cents a pen in vending machines. So be sure to drop by and visit Jim this summer and tell him Teresa the Traveler says hi! HOW TO GET THERE – From Kamloops, head East on the Trans Canada Highway until you reach Sorrento and turn left onto Notch Hill Road, which you stay right on as it turns onto Davies road. Drive over the railway tracks and down the road until you see a 30 foot Texaco Sign and a 40 foot windmill at 1822 Davies Road. The museum is open Friday, Saturday and Sunday during the summer months from 10 am to 5 pm. You may want to call in advance 250-835-8439.